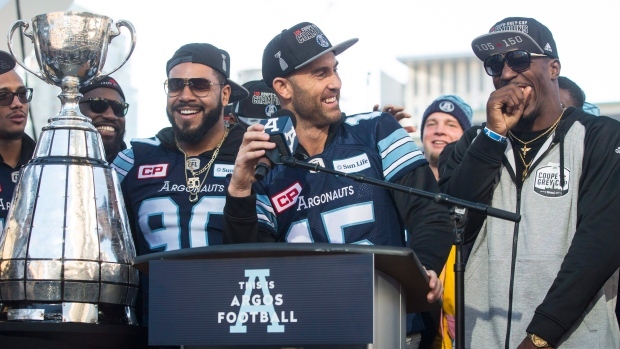 One day after hinting at returning to play in the CFL next season at his team's Grey Cup rally, Toronto Argonauts quarterback Ricky Ray told reporters he is seriously considering retiring. "I’m seriously thinking about it," Ray said. "Last year I went through the same process and this year is going to be the same way. There was a lot better ending to this year to kind of take that into consideration. I’m seriously thinking what my future’s going to be." Ray made the comments at the Argos' year-end media availability. He said there isn't really a timeline for when he'll make the decision. "Just going off of last year’s experience, I knew before the first of the year. That’s when I called (former head) coach (Scott) Milanovich and told him I want to come back. I don’t know if that’s going to be the same this year but I’d assume over the next few weeks as I start thinking about it and the end of this season wears off, I’ll hopefully be able to make that decision." A pending free agent, Ray said if he does return, it would likely be with the Argos. "I can’t imagine playing anywhere else so if I would like to come back, this would be the first choice for sure." Ray just completed one of the best seasons of his career, throwing for 5,546 yards - the second most of his career - and 28 touchdowns to 11 interceptions. For his career, Ray has 60,429 passing yards and 324 touchdowns to 176 interceptions. Sunday's Grey Cup win was the fourth of his career and second with the Double Blue. If Ray does return next year, the Sacramento State product should surpass Henry Burris (63,227) for third on the CFL's all-time passing yards list and could challenge Damon Allen (72,381) for second with two big years. Ray should also be able to surpass Ron Lancaster (333) for fourth in touchdowns and could challenge Burris' 374. As for his comments at the Grey Cup rally Tuesday, Ray said he was just having fun with the Argos' fans. "I was just kidding around. No hidden meanings there."